U.N. Turkey envoy, Kobani: Kurds should be allowed to go. 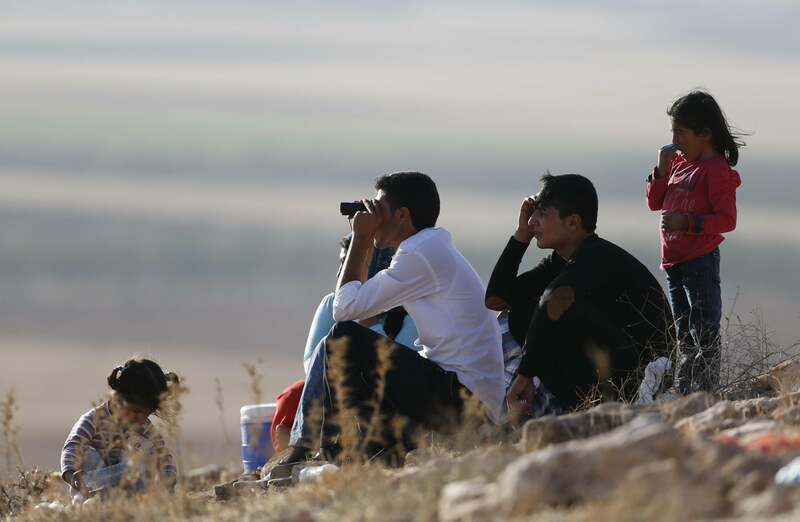 Turkish Kurds look across the Turkey-Syria border into Kobani. “If this falls, the 700, plus perhaps the 12,000 people, apart from the fighters, will be most likely massacred,” de Mistura said, referring to U.N. estimates for the number of Kurdish fighters defending the town and the total number of people believed trapped inside it. Turkish Kurds, angry about being prohibited by their government from traveling to or sending material support to Kobani, have rioted across southeastern Turkey in recent days, with at least 31 deaths recorded. Turkish President Tayyip Erdogan’s government has said it will only join the coalition fighting ISIS if the coalition enforces a no-fly zone near the Syria-Turkey border. The move could put the anti-ISIS alliance into conflict with Syrian autocrat Bashar al-Assad’s air forces—but the coalition’s ostensible purpose is only to fight ISIS, not Assad.